Are you a big stinker with breakthrough odor? Don’t sweat it. 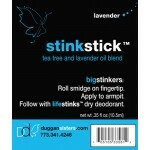 Boost the power of lifestinks deodorant with the Duggan Sisters’ stinkstick. Travel with confidence to the stickiest climates. Our stinkstick is the perfect mini companion to your lifestinks everywhere. Our sleek and ultra chic mini roll-on gives you the opportunity to go for the gusto when you need to. Simply roll a smidge of this tea tree oil and lavender oil blend on your fingertip. Apply to armpit and follow with lifestinks dry deodorant. • Puts you, not stress, in control of odor. • Takes on synthetic fabrics and high temperatures. • Holds 110 applications of pure deodorant oil booster. • Is not to be used without dry deodorant. • Works wonders as a wound-care wand. Apply to zits, bug bites, etc. Also available in cedarwood. 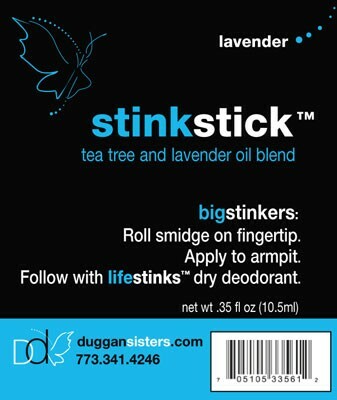 Make sure to match your stinkstick botanical to your dry deodorant.